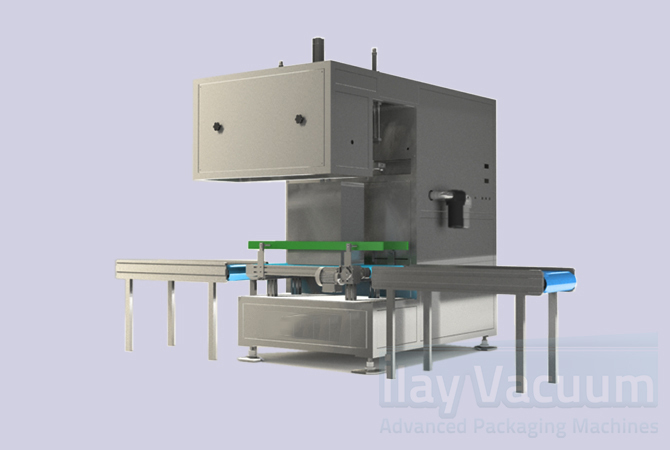 IL100 is an open type (chamber-free) vacuum packaging machine that packs the products automatically. In the range of 5-25 kg, nuts, peanuts, nuts such as nuts, nuts, beans, chickpeas, peas, lentils, such as legumes, the agriculture and field crops in general, walnuts, hazelnuts, peanuts, macadamia, pecan, shell nuts, coffee beans, cashews, almonds, can be vacuum packaged in an average of 3-6 tons per hour. Our model can be combined optionally with your pre-installed conveyours, filling unit, transfer robot, Packaging and vacuum Machines. The model has a 1 ‘meter-shaped band that is standard on the front entrance and rear exit direction. It can be modular according to product flow during production can be optionally added and designed with conveyor belt. Our patent protected line that designed depending on the requirements of the food industry. it provides very positive advantages and benefits to companies and manufacturers. At the same time, our open type and automatic model IL 100 is faster during production and the cost reduction is controlled by the eye of the human hand to achieve the desired amount of production, maximum savings of time, the transfer fees and the transportation costs are eliminated, the most appropriate and most efficient working area, capacity As the high rate of increase, VACUUM PACKAGING MACHINE VERTICAL AUTOMATIC (2 BANDS OPEN TYPE) IL 100 is gain and advantage during production and has become one of our best selling models in its field.